The giant Kashagan offshore field was discovered in July 2000, 80 kilometres south of Atyrau. It is the largest Caspian offshore field and one of the largest fields discovered anywhere in the world in the past 30 years. Named after a prominent 19th century Kazakh poet, it covers an area 75 kilometres long and 45 wide. The Kashagan field was formed 350 million years ago in shallow warm sea conditions, lying below salt fields at a depth of 4 000 to 4 500 metres. The oilfield is estimated to contain reserves of about 38 billion barrels, 9 to 13 billion of which can be extracted using the gas re-injection method. 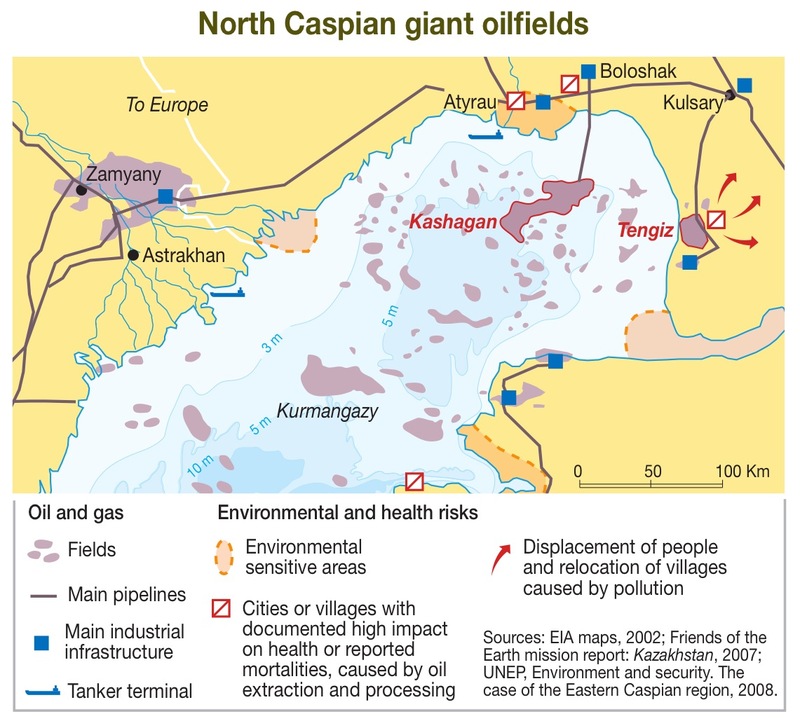 Analysts hope that Kashagan will prove to be one of the world’s largest offshore fields and also provide a reliable indicator of the Caspian’s potential oil supply (German, 2008). Its oil is characterised by very high pressure (800 bars), temperature (125°C), hydrogen sulphide content (15-20%), and the presence of naturally occurring toxic substances (mercaptanes). This creates major logistical difficulties and could even turn a small emergency into a large environmental disaster. For example, in 2000 and 2001, minor emergencies during exploratory drilling reportedly led to the discharge of pollutants into the sea. 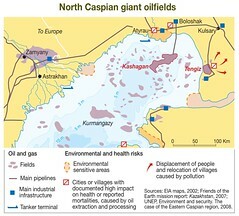 In August 2007 the Ministry of Environmental Protection of Kazakhstan stopped exploration of the Kashagan oilfield due to alleged violations of environmental legislation. On 14 January 2008 a new Memorandum of Understanding was signed between the companies in the Kashagan consortium. For any form of publication, please include the link to this page and give the creator credit (in this case Riccardo Pravettoni, GRID-Arendal) If the high-resolution file is not available, please contact grid@grida.no for request and permission for usage.